This is just a brief note for those who are interested in or confused by surfactant elasticity. Interfacial elasticity is of great importance to many aspects of surfactants. Unfortunately, other than for foams it is rather hard to pin down elasticity effects. which is calculated in the CMC and Γ app. This is the basic stretching elasticity, the force needed to increase the area of the surface by a given amount. However, this is a rather theoretical construct that is of little use in practice - it is often 1-2 orders of magnitude too large. This is because the force required depends on the speed of testing. 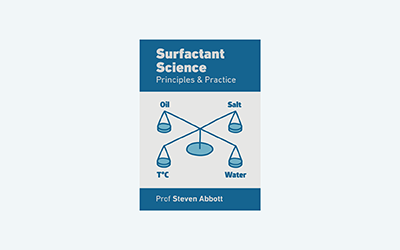 At very slow speeds, as the surface is expanded, fresh surfactant fills any gaps and so the effective elasticity is zero. When it comes to bubbles and foams the straightforward stretching mode is highly meaningful and after an initial period where everything is changing, the surfactant bilayer has a fixed quantity of surfactant over a fixed distance and, as shown in Foam Elasticity much of practical interest can be calculated. Another area where elasticity is vital, and where the time-dependent effects are explicitly taken into account is in the modelling of DST around equilibrium. Another complexity is that elasticity of curved surfaces (rather than the idealised straight surfaces involved in CMC measurements) also depends on bending parameters that are confusing to most of us. As Wikipedia often says: "This article is a stub". Hopefully it will get filled in at a later time.